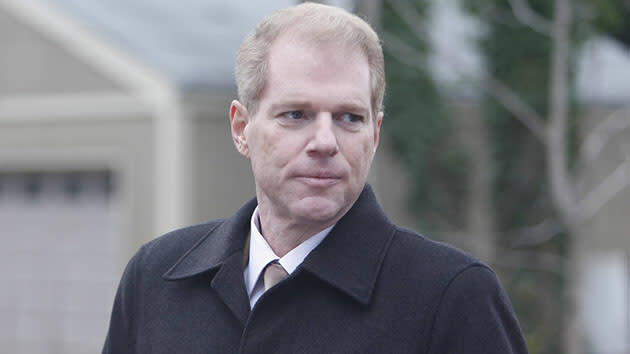 Noah Emmerich as FBI Agent Stan Beeman on "The Americans." Let's get this out of the way: If you're not yet watching FX's latest drama, "The Americans," why not? It is fantastic, and it has gotten better each week. Yahoo! TV had the chance to talk with FBI counterintelligence agent Stan (Noah Emmerich) -- whom movie fans know as a scene stealer in flicks like "Beautiful Girls," "The Truman Show," "Little Children," and "Pride and Glory" -- about his compelling character, his decision to take on his first regular TV series role, his conflicted feelings about Twitter, his "Glee"-ful singing past, and his celebrity friend and fellow a cappella singer, "Scandal" and "The West Wing" star Joshua Malina. Last week's episode was kind of a game changer all the way around, definitely for Philip and Elizabeth and their relationship, but also for Stan, in this big plan that he has for Nina. Stan's juggling a lot … his work, his relationship with his family, his new friendship with Philip, a lot of tension in all those areas, and obviously a lot we still don't even know. Which aspect of the character are you having the most fun playing? The most interesting work is always the complexities and the colors and the textures of the experience of, ultimately, life, which is less about plot and more about the human relationships and our understanding of ourselves and our understanding of our place in the world and how we relate to those around us, our family, our co-workers, our friends, the affairs of the human heart, I guess. All those relationships have different offerings and possibilities and nuances that I find equally interesting, because they're in completely different realms. There's a loneliness to Stan. And Philip, I think he's interested in … again, it's hard for me talk about it, in a way, because we're in the middle of it. I feel that Stan should speak for himself. I don't think Noah Emmerich should talk about Stan, to some degree. I don't want to tell people what to think or what's interesting or what's not interesting, but I can just tell you that for me, as an actor, all those relationships hold a lot of potentially interesting areas to explore, in terms of friendship, love, family, responsibility, morality, obligations, identity of self, identity within a family, identity within a job, identity within a social structure, a neighborhood, a father, a husband, a co-worker. All those things are quite dynamically being explored in different degrees in different episodes. Hopefully, over the course of the whole series, it will be a full, interesting picture. But they're all interesting to me in different ways and different aspects that, hopefully, people relate to it in their own lives, whether or not you're a counterintelligence agent or a schoolteacher. These are things, hopefully, that have a commonality to our understanding of ourselves and our relation to the world around us that will resonate somehow. "The Americans," like most other FX shows, is very smart. It assumes the audience can figure out things without having to be hit over the head with them. Is that one of the things that attracted you to the show? Yes, there's definitely an inherent intelligence to the piece. All I read was the pilot. It was one script. It definitely, to me, stuck out as extremely intelligent and not pandering and loaded with potential for all kinds of interesting possibilities, which, I guess, is what you're looking for in a pilot. To be honest with you, like I said, I have never done a series before. I was resistant, for various reasons, to the idea. It was really actually my friend Gavin O'Connor who directed "The Americans" pilot, and who I've worked with a large amount. All the movies he's made I've been in, and we have a great friendship, professionally and personally. He called me and said, "You're crazy if you don't think that you should do this." I said, "Really? Why? What do you mean?" The truth is, from the very beginning, I thought, "I don't want to do a TV show where I carry a gun or a badge. I'm done with guns and badges. I just don't want to do that anymore." When I first read it I thought, "Yeah, it's really interesting and really good, but I don't want to be an FBI guy. I don't want to do that for five years. I can't do it anymore." Not that I've done this specifically before, but I have played a lot of cops and done different things like that. It was Gavin, actually, who shifted my perspective and opened my eyes to the potential that it held and gave me the impetus to really give it a hard, second look. Then I realized that I agreed with him, that actually there were a lot of, that it wasn't about guns at all, really, and I was being somewhat superficial in my aversion to [playing] anybody with a badge. I don't know why we're so fascinated with badges and guns on television, especially. And in films, as well, but as an actor it was a great joy to do that many times. Every kid wants to play a cop or a warrior. But after you've done it enough times, I started to feel like, "Couldn't I do something different?" But anyway, this show is not about that. The show really is, at the center, about a marriage and family. And then there are the fractals of that. I think Philip and Stan, in some ways, are two sides of the same coin. In some ways they're the same person, actually. And I thought, "OK. Don't be blinded by the badge. Look at what they're really talking about, what [series creator] Joe Weisberg is really writing about." It was really interesting, and it was really intelligent and unusual, and it stood out from the pack. No. I love that they're continuing with that. That was one of my apprehensions, because it could have turned into just a rote television procedural series, where they force the actors to just talk exposition and explain the plot. A lot of times you're just explaining plot. They have totally not done that. It's incredible that they do give great credit to the intelligence of the audience. If some people are confused now and then … Friends of mine will say, "Who was the guy that…?" And other people get it all. At times, maybe you need to look at it twice. That's OK. I think asking the audience to lean forward as you lean towards them is a healthy dynamic. I'm a big of John le Carré novels. I love all those, and the films, as well. "Tinker Tailor Spy," I thought, was great. I think we're in that neighborhood … trying to be, at least. It's OK if the audience has to catch up or do a little bit of work to understand what's going on. Life is like that. It also helps that we have great people. We have a great cast, and we have a great crew. We have great writers. It's quite fun. I really look forward to going to work every day. You said you had really just the pilot before signing on … how much did you know about Stan, then? There's obviously a huge backstory to the character, and his time undercover with the white supremacist group, that we have yet to find out. Not a lot. Well, I knew a lot, and then I knew not a lot. It's an evolving reality. That's another thing that's interesting. It's dynamic, and a lot is not set. It's not written yet. When we started the pilot, I met with Joe Weisberg, and we had a long conversation about what Stan was for him and where he saw Stan going … in the interim, that's changed quite a bit. Things have changed quite a bit, and they evolve, and that's part of the thing that's really shocking about television. In Episode 3, they may drop a piece of information into the storyline about the character that didn't exist before Episode 3, but of course, it resonates all the way back through his life. It's like improvisation. You're constantly finding things out about the character that you didn't know, that didn't exist, that's just been invented. Even the backstory about the white supremacists … when we started shooting the pilot, that wasn't established yet. That had not been invented yet. We had a different backstory when we began the pilot, and then it changed in the middle. I knew sort of the foundation of the character. It's almost like a child, you know? It's born into the world and a lot of it is genetics (are established), but you don't know what you're going to get. It's the same with television characters. You don't know what's going to happen throughout the season. I think the writers also become peaked by certain colors or tones or notions and players. And as this is happening, they decide, "Well, let's go more with that. Let's come up with that." So it's a collaborative, evolving, living, sort of thing. Are we going to get a little deeper into his experience with the white supremacists, which has obviously impacted his career and family in a major way, as the season goes along? I hope so. But I don't really know. I get the scripts between two and four days before we start shooting. Switching to another great show that you were a part of, have you kept up with what's happening on "The Walking Dead" since your pivotal role as Dr. Jenner in Season 1? Somewhat, but I guess I would have to say no, not this year. When I filmed the show, I don't think any of it had been aired yet. My repertoire of knowledge of television shows is pretty slim, unfortunately. I don't watch a lot. But I watched that show a few times, and I thought it was fantastic. Really, really well done. You have become a more regular Twitterer, though your account isn't verified … so is that really you on Twitter? @NoahEmmerich. That's me. Yeah, I'm not really an active Twitterer, but I have just started doing some of it. I don't how you get that verified … someone said that to me the other day, that you have to get verified, but I don't know how to do that. I don't have a publicist, so maybe that's the problem. I don't have the machinery in place to be verified, but I feel like I'm verifiable. Just, here I am. According to IMDB.com, you were in a Yale a cappella group called the Spizzwinks(?) … true? That is very true. The Spizzwinks(?) are the second oldest collegiate singing group in the country. They were formed after The Whiffenpoofs, which was the first collegiate singing group in the country. The Spizzwinks(?) were formed in 1914, and they were named after … that was the year after there had been a crop blight I believe in Idaho. I think it was in Idaho or maybe Iowa. It was a bad corn year. The farmers blamed the bad crop on this mythological sort of elfish creature called the Spizzwink, which I think never would have lasted in history if not for a bunch of Yale undergrads who decided to name their group "The Spizzwinks(?)" And the spelling of The Spizzwinks(?) includes a question mark at the end of the word. But it's just one of those a cappella groups, four part harmony. I was a musician as a kid. My mother's a pianist. I grew up as a trumpet player, and when I got to college I put down the trumpet, but I took up the voice as a way to sort of continue with music in my life. I had a great time doing that. We toured all over the world singing goofy Cole Porter, great mid‑century, and some modern stuff, a cappella. Now I guess it's a really incredibly hot activity, with the "Glee" phenomenon. But when you arrived at Yale your freshman year, the first week is sort of a bunch of orientation activities, and Yale undergraduate singing is a big deal. There are like 12 groups there. It's a big niche extracurricular. And one of the events they had at first week freshman orientation is a big jam concert where all the groups performed, and they encouraged people to come out and try to join them. And that concert was just like, for me, a great moment. "Wow. I want to do that." I remember growing up, I was a fan of Sha‑Na‑Na. Yeah, exactly. (Sings) "Do‑do‑do‑do-do, goodnight." So there it was in full glory, and they were great. Some really great singers were there. So I was like, "I want to try." I auditioned and rushed … in fact, a real piece of trivia, Joshua Malina, the actor who's on "Scandal," was my college roommate. And we were in The Spizzwinks(?) together. We thought we saw a tweet from him about you, encouraging people to watch "The Americans." Oh yeah. He's a very heavy pressure in my life to get involved on Twitter. He's a real twitterer (@JoshMalina), and his tweets are hysterical. He's one of the funniest people I know, and his tweets are quite wry and funny. I met him through The Spizzwinks(?) and we've been friends ever since. "The Americans" airs Wednesdays at 10 PM on FX.